Holds The fixed side of the mold to attached at the fixed platen of the injection machine. at this plate will attach locating ring, eye bolt, and sprue bush. this plate only used in 3 plate molds type, the function is to cut resin from nozzle in top of sprue bush, and pull the runner by runner locking pin. 3. Fixed Mold Plate or Cavity plate. use to hold cavity side of product, leader pin, support pin, Puller bolts, and Angular pin when slider attached. it used to attach core side of product, return pin, leader bush and slider core if needed. used to support cavity plate, attach the hole for return pin's spring, and cooling channel when in cavity plate can not make it. part. the required length of spacer block depend on ejector stroke that needed to eject product. to hold the ejector, Z pin, shoulder bolts,and give space to ejector leader pin and support pillar. Pushes the ejector pins and return pins, connected with ejector rods. Holds The movable side of the mold like spacer block, support plate, cavity plate and ejector mechanism to the movable platen of the injection machine. 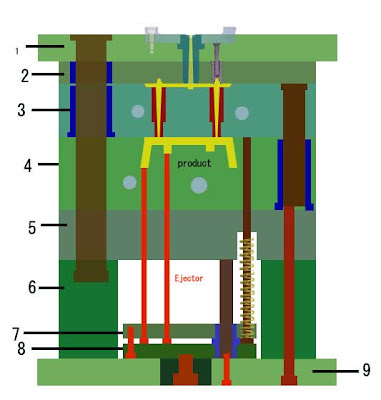 and look at picture below, shown 3 plate molds type in opening position, but at picture below, Bottom plate or movable clamping plate is number 7, number 8 is ejector retainer plate, and number 9 is ejector plate. Plastic mould can create many things like bottle mould, vegetable crate mould, home appliance mould, washing machine mould, air conditioner mould, chair mould, commodity mould, and auto parts mould and so on. This is a popular raw material for parts mould manufacturing. Low cost and extensive use in injection mould.plastics injection mold will be more and more popular all over the word in the coming days. Enter your comment...lI like the mould and mould parts and its function. Thanks for posting such a good blog having very helpful information! Plastic mould can create mold in any shape, that is why Custom Mould became very popular raw material for parts mould manufacturing! I like this blog which is perfect travel updates to get shared the best tools. Thanks for sharing such an informative post. This technology can be very beneficial for a Mold manufacturer. Please elaborate more on how to install it in industry. thanks!! Supplements For Fitness Eye disorders Another benefit that many experts have exalted about fish oil is the treatment of certain eye disorders. Its regular consumption seems to help people avoid the effects of age-related macular degeneration. .
At Global Plastech, you can attain a wide variety of stable, durable, energy saving and High Speed Injection Moulding Machinery 378-HS at the most reasonable rate to any country client.